Canadian Governor Mr.Johnston had ice and snow exchange visit in Beijing,President Xi had met with Governor Mr.Johnston in Diaoyutai State Guesthouse on July 13th. 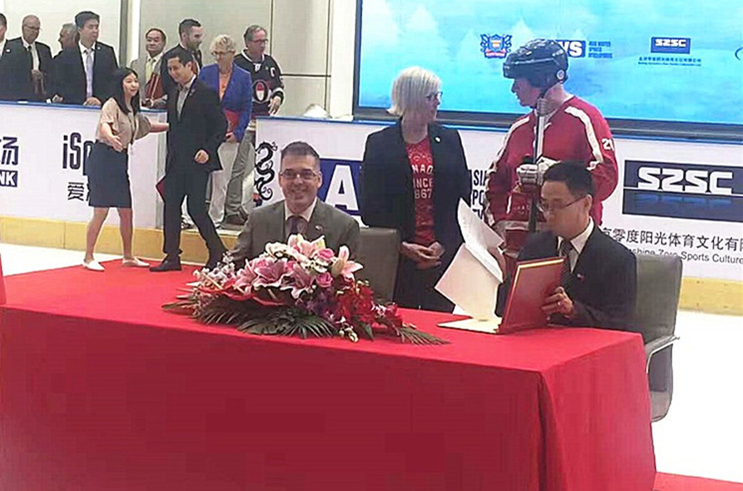 CTC Group signed strategic partnership agreement with Pan-China Sports at ChaoYang Joy City in Beijing on July 14th. This strategic partnership agreement signed by CTC Group and PAN-CHINA Sports is announced to established excellent cooperation relationship of mutual support,joint development, long-term comprehensive.Providing high quality service to 2022 Beijing-Zhangjiakou Winter Olympic Games projects,to promote the development of China ice and snow sports. Canadian Ambassador to China,Mr. 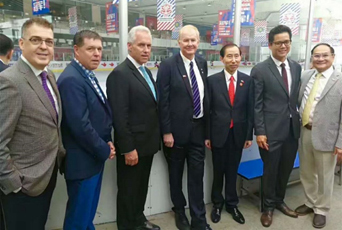 John McCallum, the chairman of Beijing Canadian International School,Mr.PengJianhua, the chairman of CWHL,Mr. Brenda Andress,the excutive chairman of CICCC,Mr.LongYuxiang,the counselor of CICCC,General LiYunzhi,the founder of KunLun Red Star Hockey Club,Mr.YueXinyu attended this spectacular signature ceremony. The estimate for the bidding of 2022 Winter Olympic landmark stadium will start in the end of July,2017,and adopt PPP(Public-Private Partnership)mode cooperation for first time,CTC Group and Pan-China Sports are actively joining the bidding project of 2022 Winter Olympic stadium. A Canadian leisure and refrigeration specialist, CTC Group is a leading provider of world-class Ice and Snow sports and recreational facilities such as CANADOME ice rinks, snow domes, ice snow playgrounds, curling, etc., for our customers all over the world. The company offers total Solutions, integrated and adapted to the specific needs of each project, from planning, design, engineering, technologies, installation, after sales support, facility management, operation and sports content. CTC built Asia’s first Air Dome Ice Rink in Beijing. Beijing Pan-China Sports Industry Co.,Ltd(stock code:836042)was established in 1997 and is a cross-reginal,integrated sports industry group company.The main business of Pan-China are: Sports Industry Investment、Management of sports events and sports clubs、Sports Facilities consulting and planning、design-building and management.Pan has good relationship with General Administration of Sport of China 、Beijng University China sports industry research center,etc. © 2015-2025 CTC Group Ltd. All Replica Reserved.